Review: "Foster, Mo: Bass Themes" - Sea of Tranquility - The Web Destination for Progressive Music! Glancing at bassist Mo Foster's musical resume reads like a who's who of popular music. The British industry vet has appeared on hundreds of sessions ranging from Peter Green, Ringo Starr and the Michael Schenker Group, in addition to touring the world and performing concerts with the likes of Jeff Beck, Sting and Eric Clapton, to name just a few. As if that wasn't enough, Foster has also worked with The London Symphony and Royal Philharmonic Orchestra's and done quite a bit of music for television and films over the course of his storied career as well. Foster's sixth solo album Bass Themes, released by Angel Air Records, is an ingenious collection of production music that was originally recorded and commissioned between 1983-2009. As is to be expected with such a compilation of this nature, the listener get's plenty of variety within these thirty compositions, as Foster covers a lot of ground and yet is still able to deliver a cohesive sounding disc, that explores a plethora of intriguing and often exotic themes. Although some of these musical vignettes (ranging from a minute and half to three minutes) do come across as sounding a bit dated, these moments are thankfully few and far between, as Foster's flair for painting a widely diverse palette, far outweighs the odd use of cheesy sounding drum machines and rudimentary 80's synth patterns. His sublime, trademark, fretless bass playing adds so much depth and emotion to the standout tracks "Afternoon In Kyoto", "Driving Ventura", "South Coast Samba" and the graceful and poignant "Goodbye Old Friend". He dabbles in some slickly produced funk on "Relentless", "Ralph's Day Out" and "Alone In New York City, while jazzing things up a bit more with the slinky, mysterious groove on "All Night Stake Out". These tracks are really just the tip of the iceberg though, because the listener will find a veritable treasure trove to discover within all of these expertly crafted compositions. Bass Themes has been constructed in such a way that it touches upon a lot of different musical themes and emotions, so there's pretty much something for every mood. 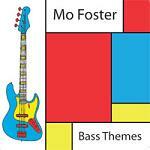 I can give you thirty different reasons why Mo Foster has been such a prolific and in demand session musician over the years, and you can find them all right here on Bass Themes. Mo Foster is one of the most in demand sessions musicians in the UK having featured on an incredible 350 plus albums. Bass Themes, which is Foster's sixth solo venture brings together thirty short, sharp pieces of "production" music, which in other words means that it was originally written to accompany visuals in film or TV. Now it is hard to be critical of an album that contains unquestionably high musicianship, but when I'm reviewing a CD the last thing I ask myself before I start typing is, "Will I listen to this once the review is done?" and in the case of Bass Themes the honest answer is no. The reason for that is actually the motivation behind the music on this album, as when it was put together, it obviously had the purpose of moving a scene, or shot along in a manner that would be sympathetic to what was happening on screen and on that level I have no doubt that each and every one of the songs here would work perfectly. For example "Good Cop Bad Cop" has the drama and suspense any interrogation needs, "Storm Warning" fills the air with foreboding, conjuring up the calm before the winds howl and the rain lashes, while "Staring Into The Abyss" is pensive and introspective. In fact every song here takes you to a scene and you can picture the images and ideas that their titles suggest with ease and that to be fair is what they are meant to do. However as an engaging listening experience these unsurprisingly bass led tracks fall quite some way short and at the risk of sounding harsh are actually rather boring when presented like this. There's a reason that backing music usually stays in the background and after thirty songs worth of Bass Themes, it's fair to suggest that I know why.